The first observation was made, obviously, as soon as the lens cell was fitted in the tube. The daylight observation of the bell tower of “Bagnacavallo” town showed immedaitely the superior quality. The real first light was in the night, two days later, on Saturn, Moon and some double stars. Astonishing! The stars were really ... pin-point! Of course ... everything!, but I prefer planets, Moon, double stars and, from time to time, our Sun. Well, Jupiter, Jupiter, and them, I almost forgot .... Jupiter ! 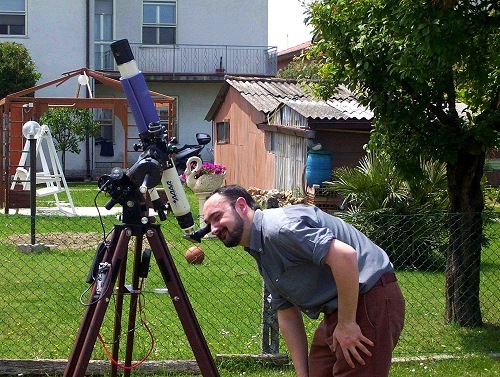 I use mainly an 8 mm Plossl eyepiece by Clavè and a 6 mm Zeiss on planets. On the Moon, a 12 mm Clavè and a 15 mm Celestron. I tested it side by side with my 15 cm Mak. Well, 15 cm makes a lot of difference, but the quality of the image is stunning. VERY much, more, having made by myself the OTA it light and very easy to use. Cons? The finder, but it’s by Meade ... and this explains everything.